No one expects a disaster to strike. Yet, each year dozens of communities just like ours are left scratching their heads and pleading for help following an earthquake, hurricane, flood, wildfire, or other event. Some day it will happen here. The first step is to ensure that you and your family are able to be on your own and comfortable for at least a week. Food, water, heat, and your regular medication are all critical. Once this is done, it is time to look at the animals in your life. They're counting on you to take care of them. 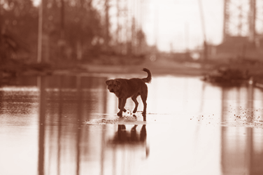 Have food, water, a care plan, identification, and any required medication for your pets.